When the maintenance of stem cells is disrupted, the consequences are often very visual. In the case of this tomato plant, the cells driving flower growth have over-proliferated, creating a disorganized mass of petals. When it comes to stem cell management, all flowering plants work to maintain the same status quo. Researchers have now identified the various strategies plants use to preserve a single, essential genetic circuit. Cold Spring Harbor, NY — Despite evolution driving a wide variety of differences, many plants function the same way. 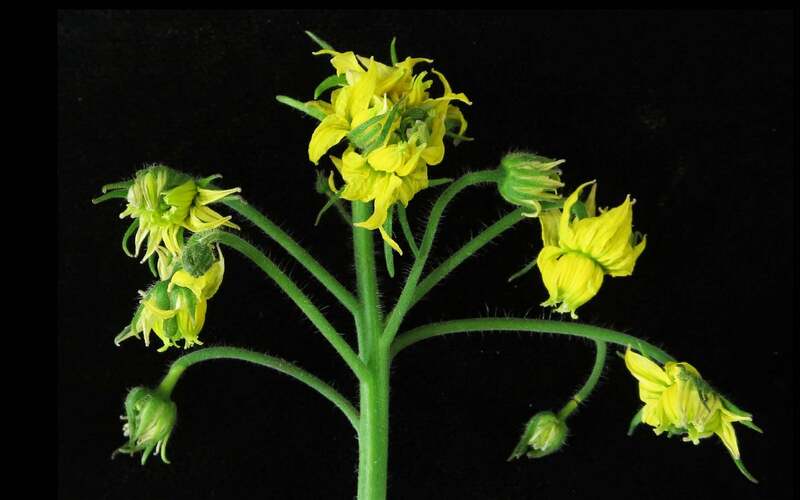 Now a new study has revealed the different genetic strategies various flowering plant species use to achieve the same status quo. That’s also why having too many or too few stem cells can disrupt a plant’s growth. Responsible for all this is a “core genetic circuitry found in all flowering plants,” says CSHL Professor and HHMI Investigator Zach Lippman. In a paper published in Nature Genetics, Lippman and CSHL Professor David Jackson describe the genetic mechanisms that ensure “a deeply conserved stem cell circuit” maintains some function, even if defects occur in a signaling protein called CLV3, and the receptor with which it interacts, CLV1. When the CLV3 circuit is disrupted, the stem cells making up a maize plant’s meristem can become disorganized (greyscale, right). As the crop matures, the results of an especially disruptive genetic mutation become more and more apparent (left) when compared with an unaffected ear (WT). “Those players are critical for ensuring a plant has the right number of stem cells throughout life, and we discovered there are backup systems that kick in when these players are compromised through chance mutations,” explains Lippman. If the gene producing CLV3 is disrupted by a mutation in a tomato, for instance, a related gene will stand in for it. 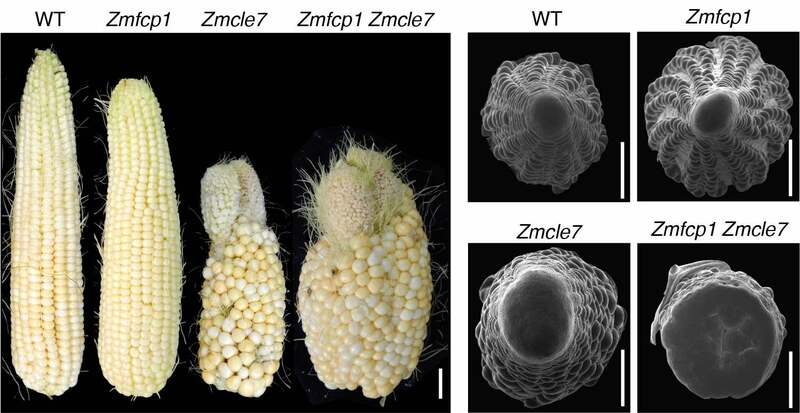 However, Jackson’s team discovered that in the case of maize, two genes are working in parallel to produce the essential signaling protein. According to Jackson, Lippman and their colleagues, understanding these species-specific strategies for protecting key genetic interactions will be essential for achieving “intelligent crop design” and using genome editing to improve agricultural productivity and sustainability. This research was funded by the National Institutes of Health, USDA National Institute of Food and Agriculture and the Next-Generation BioGreen 21 Program, National Science Foundation Plant Genome Research Program, a PEW Latin American Fellowship, and the Rural Development Administration, Republic of Korea. Rodriguez-Leal, D. et al. “Evolution of buffering in a genetic circuit controlling plant stem cell proliferation” was published in Nature Genetics on April 15, 2019.